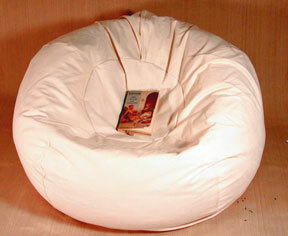 Our soft and durable Cotton Beanbag Chair is oversized for casual comfort. The strong heavy twill unbleached cotton cover is removable for machine washing and the inner unbleached cotton shell is zippered and contains a generous amount of 100% recycled non-toxic polystyrene beads that will mold and conform to your body's needs. This will be the best seat in your house. Adult sized 130 inches in circumference. Made in USA.